A group of German researchers have recently documented the connection between a mother's sugar intake and the brain activity of the baby she carries. Their study involved fetal response to outside stimuli while their mothers were in the process of a glucose tolerance test. The fetal response was slower in mothers with insulin resistance than in the mothers with no problems metabolizing sugar, indicating a fetal brain insulin response directly affected to the mother's sugar intake. The study's findings suggest that a person's risk of diabetes and obesity in later life is pre-programmed during gestation, according to the research team led by Drs. Andreas Fritsche and Hubert Preissl. The research team and colleagues are affiliated with the University of Tübingen and the German Center for Diabetes Research in Neuherberg. The team recruited 13 healthy pregnant women to undergo an oral glucose tolerance test involving 75 grams (g) of glucose. The 75g dose is the standard measure when testing for insulin sensitivity. Once the study participants ingested the glucose, the amount of glucose and insulin in their bloodstreams was measured at three intervals: at the time of ingestion, 60 minutes later, and 120 minutes later. At the same three intervals during the women's glucose tolerance test, a magnetoencephalographic device was used to elicit a fetal response to the sound the devices emitted. At the 60-minute mark, fetal response was slower in the women who tested positive for insulin sensitivity. The fetuses of the women who tested insulin resistant (no problems metabolizing sugar) reacted to the sound an average of 283 milliseconds after it started. In the insulin-sensitive group, fetal reaction time was 178 milliseconds. The research team says their findings support a 50-year-old theory that fetal response to its mother's sugar intake is similar to the mother's metabolic response to it. "As glucose passes the placenta, these increased glucose levels induce excess insulin (hyperinsulinaemeia) in the fetus," writes the researchers. High insulin levels may be a "prerequisite for appropriate brain maturation," speculates the research team but too much insulin may be, simply, too much. "Chronic hyperinsulinaemia, which is present in insulin-resistant mothers and corresponds to high insulin levels in the fetus, might induce insulin resistance in the fetal brain." The researchers liken the insulin-resistant effect on the fetal brain to metabolic imprinting that could affect health during childhood and adulthood. "Children of diabetic mothers with poorly controlled glycaemia show neurophysiological impairment and have a higher risk for metabolic syndrome, obesity and type 2 diabetes mellitus in later life" than non-diabetic mothers, according to the researchers. Source: Fritsche, Andreas, et al. "Maternal insulin sensitivity is associated with oral glucose-induced changes in fetal brain activity (abstract)." 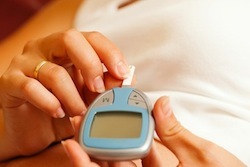 Springer Link / Diabetologia. Mar 2014.